The Labour peer's concerns were echoed by others in the House of Lords worried about "hoodlums in Lycra". But Tory peer Lady Barran said only a "small minority" of cyclists, motorists and "smombies", people on smartphones walking like zombies, caused problems. Could these three changes save cyclists' lives? 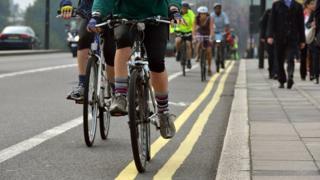 Lord Winston said: "Most cyclists, of course, are conscientious and law abiding. Ulster Unionist Lord Rogan said the crossing outside the Houses of Parliament was "an accident waiting to happen", especially at rush hour, because of cyclists. And Labour's Lord Wills said existing measures to punish poor cycling behaviour were not being used. He said: "Does the minister really think there is so little irresponsible cycling on pavements? "And if she doesn't think that, what is the government going to do to protect disabled people, vulnerable pensioners, mothers with buggies and many others from these hoodlums in Lycra?" But Conservative peer Lord Robathan, the former chairman of the All Party Cycling Group, said: "Should we not consider whether we wish to encourage cycling for the health benefits that it gives, and indeed the advantages to reducing congestion, or whether we wish to deter cyclists with unnecessary regulation which will keep the police busy for the next 100 years?" Lady Barran said the government "wants to insure safety for all road users, including pedestrians and cyclists" but establishing a central register - especially when three million cycles were sold every year - would be too "cumbersome". Correction 19 March 2019: A previous version of this story wrongly attributed Lord Rogan's quotes to Lord Sharkey.